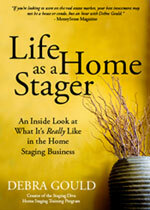 I’m writing a book about what it’s really like being a home stager. Part of it will be a collection of stories from home stagers like you. If your story is selected, I’ll send you a free copy of the finished book. Plus, you’ll be featured in a special section with your name, company name and contact information. This will be a published book and a great chance for you to promote yourself not only in the book itself, but consider the marketing and PR value of being able to say you are in a published book! Think about an experience you’ve had with a client or in your home staging business. It might be heartwarming, funny or scary but we want examples in the life of a home stager that will grab an audience’s attention! Your story won’t be directly tied to you so you don’t have to be afraid of what a client will think if they were to read it. The opportunity to be part of this new book is open to all home stagers both new and experienced. You don’t have to be a Staging Diva Student or Graduate to participate! > If you’re interested in participating you can learn more and submit your story here.